There are a few things you can do to combat the risk of punctures. First of all, try to avoid the areas of the road that debris collects in. That tends to be between opposing lanes, around traffic island and close to the gutter where any tat gets flicked up by other traffic. So, if you spend a lot of time on a busy commute, filtering and diving to the front of queues at traffic lights you’re increasing the risk of a puncture. In which case, make sure you inspect your tyres at the end of every ride, especially after that busy commute, because that pesky nail might only be halfway in to begin with. If the roads are wet the risk is increased too, as a sharp object that’s dry tends to ‘stick’ in the rubber, whereas if it’s wet it slides in easier. 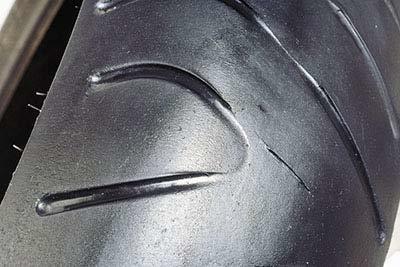 Finally, don’t run your tyres down to the legal limit as more punctures occur in the last few miles of a tyre’s life.